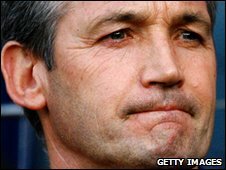 Championship side Crystal Palace have confirmed former Ipswich boss George Burley as their new manager. The 54-year-old replaces Paul Hart, whose short-term contract expired at the end of last season. Burley has been out of management since losing his job as Scotland boss in November 2009. Palace, who escaped relegation on the final day of last season, avoided liquidation when they were bought out by the CPFC 2010 consortium this month. A former Ipswich player, Burley led Town into the Premier League in 2000 and finished fifth in 2001, qualifying for the Uefa Cup. Since leaving the East Anglian side, Burley has had management spells at Derby County, Hearts and Southampton. He will be assisted at Selhurst Park by Palace stalwart Dougie Freedman.